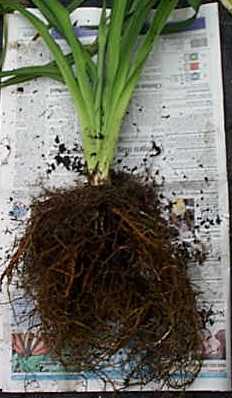 This page will provide further details regarding Daylily plants that I sell on Auctions. Background - I grow plants in greenhouse facilities located in La Grange, Ky, which is about 20 miles northeast of Louisville. The following photos (click on thumbnails to enlarge and hit BACKSPACE to return) were taken in December. 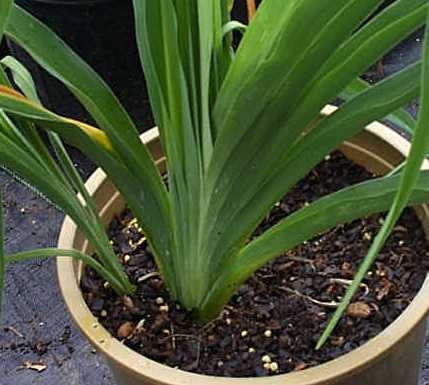 Plant Size - Being a purchaser of hundreds of thousands of plants (not all daylilies!) over the years, I am well aware of the adage "Not all plants are created equal". The following samples are indicative of the plants I ship. I do not root prune, that is left to the discretion of the customer. Single fans - If shipped early in the season, I would expect plants to bloom during the first year and actively grow in size and increase. The newspaper is shown to give size perspective to the plant. 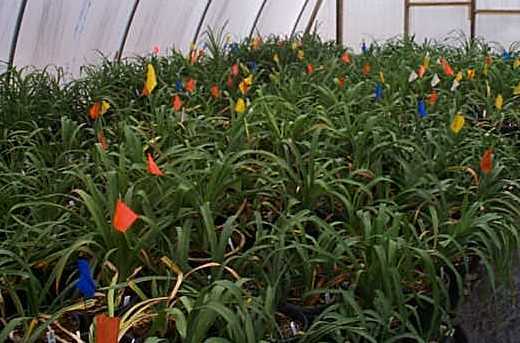 Spring Delivery - Plants designated for spring delivery are mature single fans at time of listing. Any increase will go to the buyer, so you would receive a nice single fan plus any 'children' that come along. 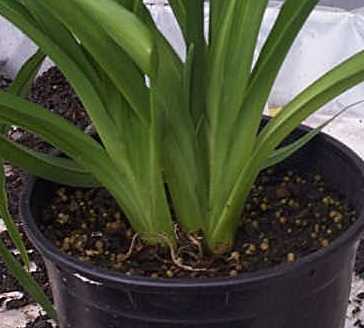 Shipping - Priority Mail is used for shipping plants at a cost of $5.00 per box regardless of the number of plants in the box. I ship on Monday or Tuesday of each week. You also have the option of picking up plants in pots if you happen to be in the general area of North Central Kentucky. 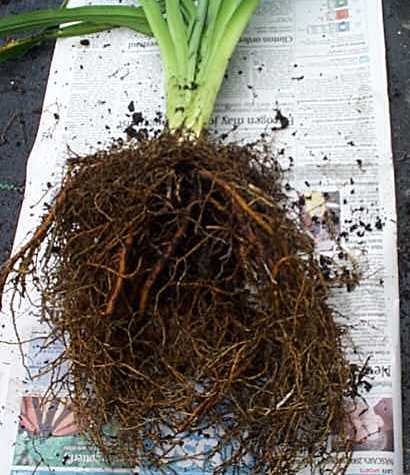 Daylilies are incredibly tough, but it is amazing how much better they perform when they are not dragged from the pot, tossed in a dark box and sent across the country in a bumpy truck for a few days! Payment - I accept personal checks, money orders or Paypal (akinback@bellsouth.net) . Plants can be shipped before payment arrives if you like. Guarantee - My goal is to satisfy the buyer in the hope that you will continue to bid on future auctions that I list. Unfortunately, stuff happens from time to time. It is my intent to keep all plants labeled properly, BUT ------. Also, plants die on occasion. 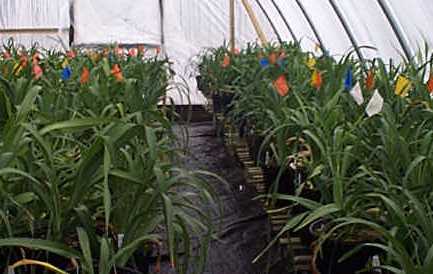 Plant stress is particularly high during the summer. I have also learned the hard way (LINDA AGIN) that plants lost for 4 days in sub-zero temperatures turn to mush. If plants do not survive or they do not live up to your expectations, please allow me the opportunity to rectify the problem. I can be contacted at akinback@bellsouth.net or at 502-419-8839. 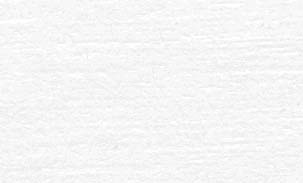 Bonus Plants - As a general rule, I do not include bonus plants, so please bid accordingly. I do reserve the right, however, to slip something extra in the box from time to time. 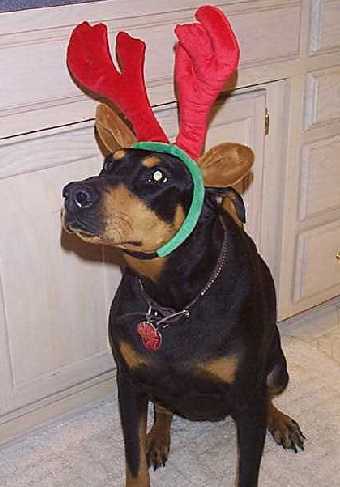 ......its none other than 'Ilze the Black Nosed Doberman Reindeer' wannabe!!!! !